Pumpkins are such an iconic symbol for Halloween. 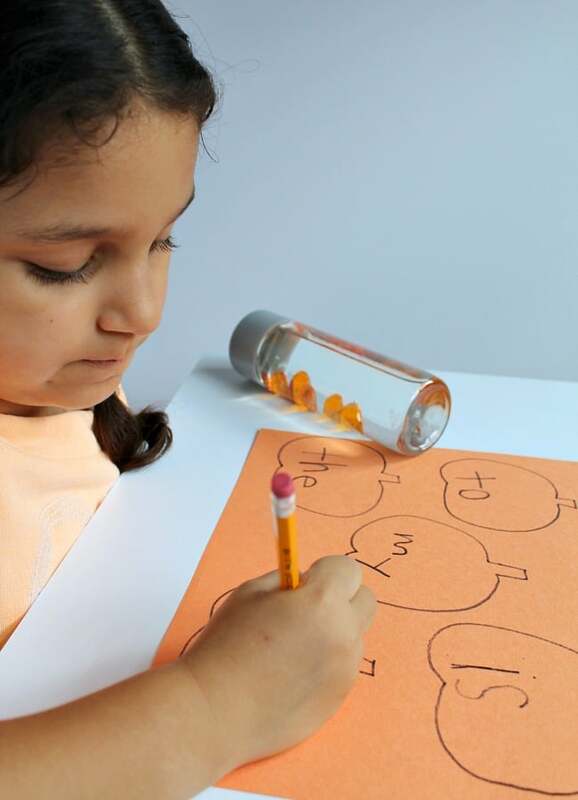 Make this pumpkin sight word game by using a recycled bottle and a few items from your local craft store for hours of reading fun this fall with your child with Sight Words. Here’s how to play. 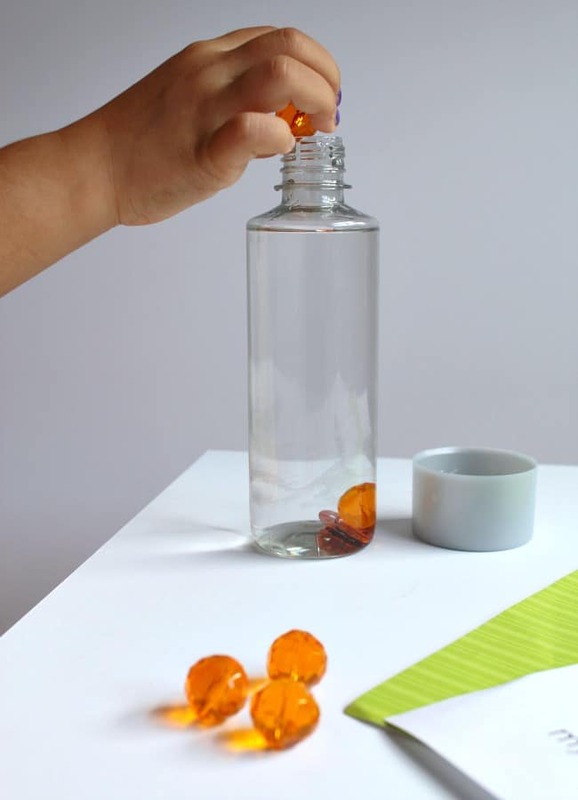 Take the song “Five Little Pumpkins Sitting on a Gate” to a whole new level with this Pumpkin Themed Sensory Bottle Game for kids. Creating hands on moments with pumpkins is my favorite way to have fun with kids for Halloween. 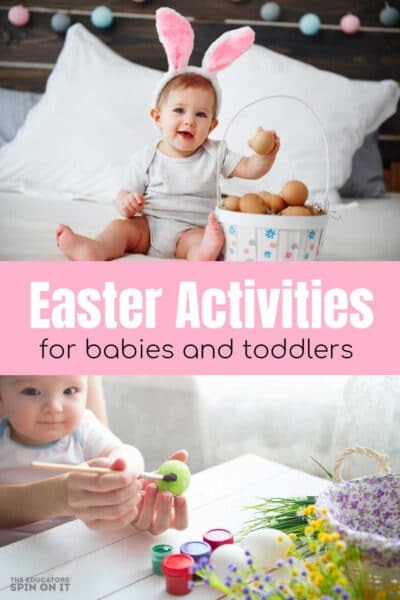 We’ve explored Water Play with Pumpkins or WashiTape Pumpkins, Stamping Pumpkins or even making Pumpkin Ice Cream with activity ideas shared on The Educators’ Spin On It. 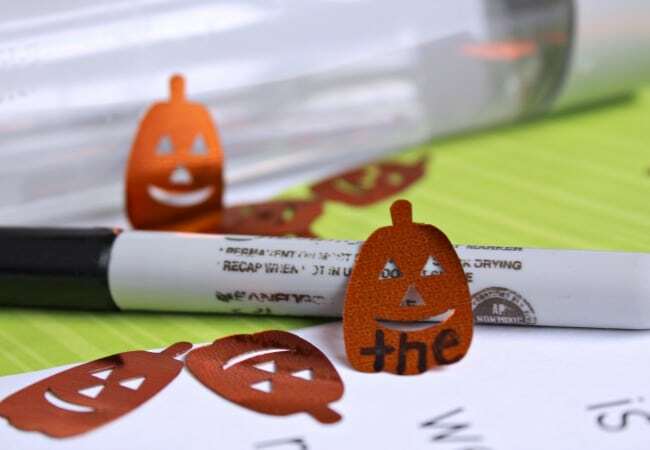 Our most popular post is our 12 Kid Made Literacy Pumpkin Ideas. This pumpkin sight word game have been such fun to play with for my Kindergartner. She’s picked up so many new sight words as we’ve been playing. Here’s how to make your own game. 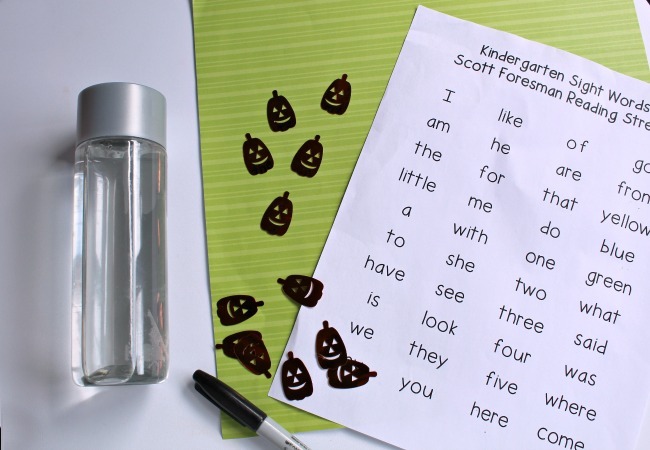 Using a permanent black marker, write 5 sight words onto 5 pumpkin confetti pieces with your child. 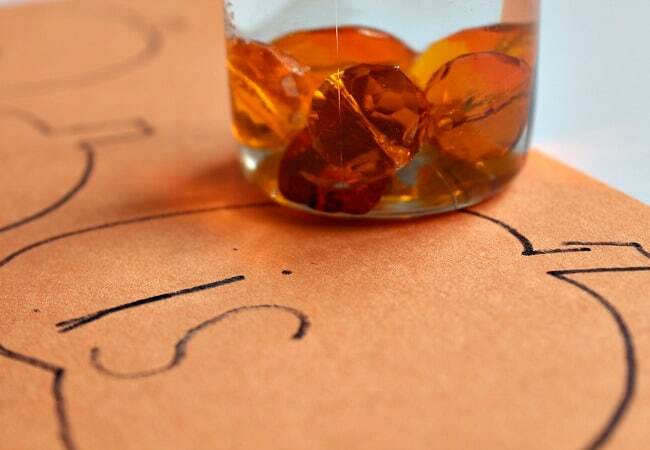 Then have your child add the 5 pumpkin words into the recycled bottle filled with water. Then add a few more items, we used orange gems to add so that they would roll like pumpkins. Then seal up the top of the bottle tight to avoid any leaks while your child is play. Last step is to have your child draw 5 pumpkins on a sheet of colored paper. Then write all five focus pumpkin sight words onto each pumpkin. To play our pumpkin themed sensory bottle sight word game it’s pretty easy and keeps them coming back to play. 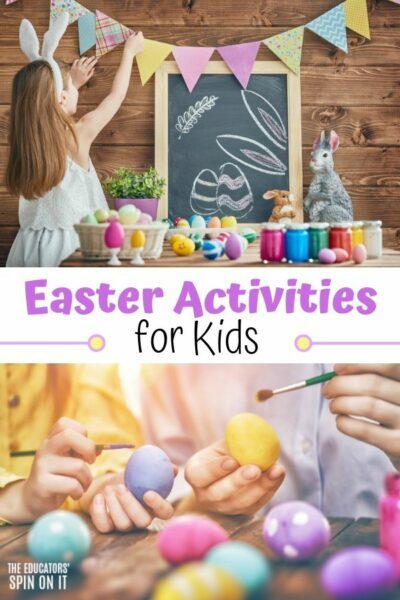 You have them shake the bottle and write down the first word that they see or lands on the bottom of the bottle, whichever is easiest for them to determine. The little playful challenge is that they need to see each sight word 5 times before they are finished. 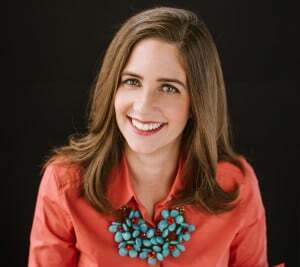 It’s a great lesson in chance and what they predict will happen. 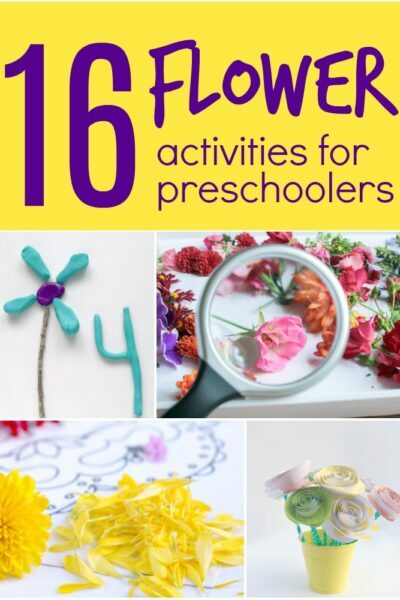 This is a fun game to keep at the kitchen table this fall while you’re getting dinner ready. They can simply sit at the table and work on sight words with their sensory bottle and a piece of paper. 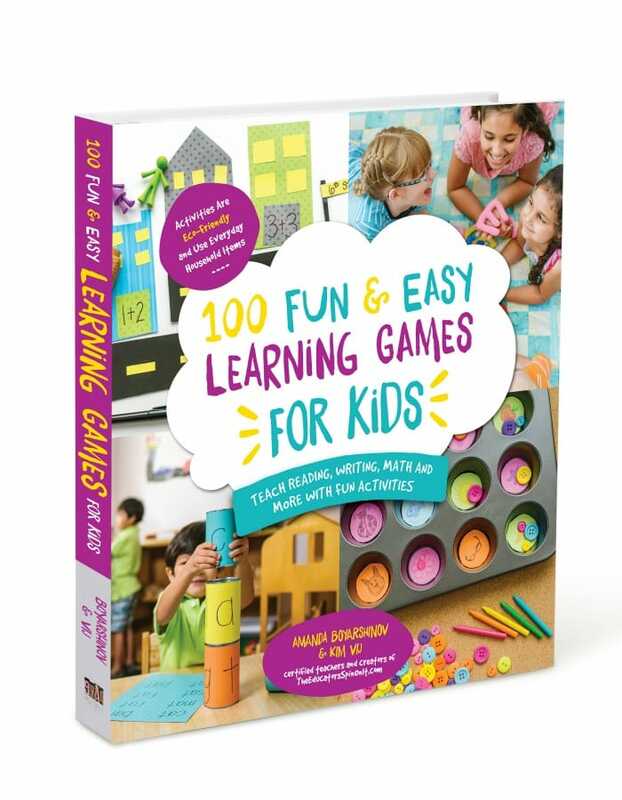 The better they get at the game you can add additional sight words to make it more challenging or simply swap out words and add five new sight words to the game. 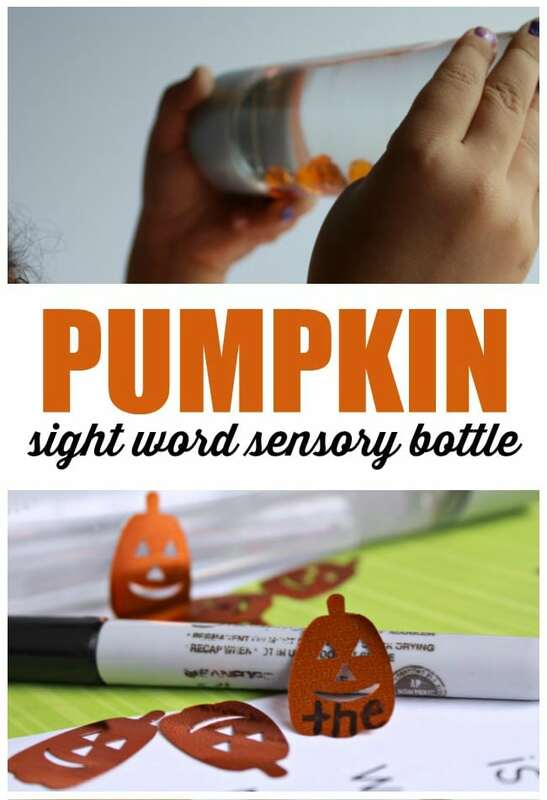 I can’t wait to hear how much your child loves playing this pumpkinthemed sight word game with a sensory bottle. It takes lots of practice but having a strong base in recognizing your sight words can lead to a successful confident reader. Are you looking for more ways to practice Sight Words this Halloween with your child? 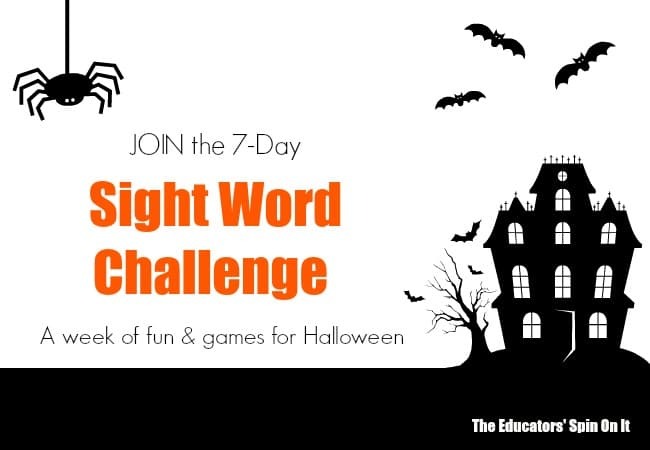 JOIN our 7-Day Sight Word Challenge! CLICK HERE to JOIN! Start with this sight word game! Join US! 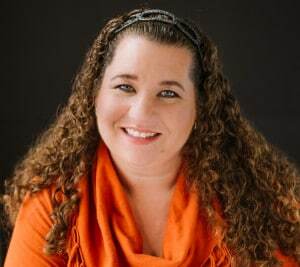 and I’ll email you ideas each day for our 7-Day Challenge all the way up to Halloween!